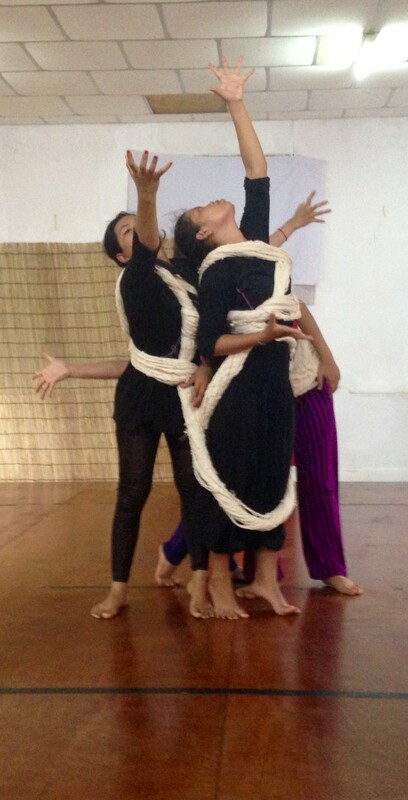 For the last couple of weeks New Cambodian Artists and me have been busy in the dance studio with the artistic research for ‘Kom Lang Satrey’ (Power Women). Our journey into the subject of domestic violence has started with taking inspiration from the ‘Chbab Srey’ (‘Women’s Law’) as it highlights the cultural context of inequality that is prevalent in Cambodia to this day. the ‘Chbab Srey’ outlines the role of women in society and paints a bleak picture of oppression and inferiority. This cultural legitimisation provides fertile ground for gender-based violence. We have taken this as a starting point for our artistic exploration developing movement themes around pain, shame, sadness, oppression and anger. The dancers have approached this difficult subject with great openness, honesty and maturity. Without your generous support I would not be able to be here and work with New Cambodian Artists to realise this amazing project! We are very fortunate to be able to premier ‘Kom Lang Satrey’ at the end of November in Phnom Phen as part of the NGO-CEDAW ‘Dignity Project’. However, in order for this powerful message to reach as many women as possible we want to take this work into the rural areas of Cambodia. Please continue to support me and help spreading this important message to women all around Cambodia!